RJ Power Rail has successfully completed its electrification and power (E&P) works on behalf of Volker Fitzpatrick. 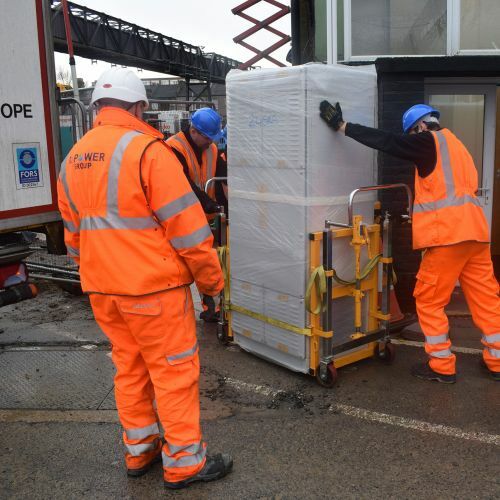 The works at Ilford Depot commenced in August 2016 and included the managed installation of points heating equipment, installation of a 650V signalling power system, installation of external lighting and also the installation of a new substation. The works formed part of Crossrail, one of Europe’s largest rail schemes. Close communication and liaison between the project teams was vital in order to provide a safe and comprehensive electrical solution. RJ Power’s role as team player with a collaborative working approach was commended by VFL’s Andy Gardiner, who praised the overall project team for their fantastic achievement in recording 500,000 project hours without any incident or accident following completion of a major blockade at the end of 2016. The team also installed a rare joint, as part of this complex E&P scope. The existing 25kV cable was installed in 1959 and was a Mass Impregnated Non Draining cable. RJ Power Rail was asked to joint this to a modern XLPE cable and did this by using a unique joint that needed commissioning by specialist Tyco in Germany. The company’s skilled rail electrification team successfully completed the works in August 2017, delivering a first class solution, the sort of which RJ Power Rail’s experienced project team thrive upon. Click this link to read the full project case study.